Watch our video 'Upacking Bird Atlas 2007–11' to find out more. Bird Atlas 2007–11 was a partnership project run by BTO, BirdWatch Ireland and the Scottish Ornithologists’ Club, aiming to map the distribution and abundance of all bird species in Britain and Ireland. Atlases aim to map the distribution of a group of species, be they plants, dragonflies or birds, across a country or region. With two previous breeding atlases in Britain and Ireland, and one previous winter atlas, Bird Atlas 2007–11 aimed to provide a comprehensive update on the distribution of all species in these islands, to map patterns of abundance, and to measure how distribution and abundance had changed since previous atlases. Bird Atlas 2007–11 was a major collaborative community project, involving around 40,000 volunteer observers throughout Britain and Ireland. Around 40 local groups used the Atlas as an opportunity to produce local atlases. It was funded by charitable donations and fundraising by the lead organisations. The book was lavishly illustrated by photographs, the majority of which were donated by local photographers specifically for this project. 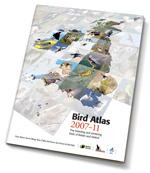 Find out more about Making the Bird Atlas 2007–11. Why is Bird Atlas important? Bird Atlas 2007–11 neatly complements existing surveys. Existing schemes that monitor the population levels of Britain and Ireland's birds rely on volunteers visiting randomly selected squares on an annual basis. These are invaluable in their own right, producing population trends and warning 'alerts', but atlas projects complement them by providing comprehensive information, covering far more squares and more species than the sample schemes can achieve. Taken together, the complete range and range change maps of the atlases and the population trends of the monitoring schemes, provide powerful tools of the trade for scientists and conservationists. The Bird Atlas book was published in November 2013 but atlas work doesn't stop there. We have made all the atlas maps available via an online Mapstore and BTO has started a programme of reseach called Beyond the maps aiming to explain the patterns and changes we see. 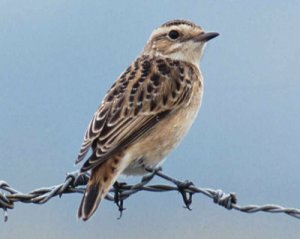 BirdWatch Ireland has published a set of key findings for Irish birds and is working on a range of conservation projects.